Yes way! Not only do we have a blog but being a true a child of the 21st century, we also have a twitter feed. 😛 And guess what? It comes right to your Dashboard. What do you suppose do we do with our little blue bird? We definitely don’t use it for nefarious purposes, although, that would be fun. We use our little bird to keep you, our beloved clients, in the know about important updates, newsletter publications and major occurrences, like last year’s Authorize.net outtages. 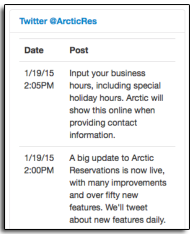 Our little bird will be tweeting away for the next several weeks as we roll out lots of new updates. (Is anyone else excited about this? I am.) There are tons of new updates that will be announced via our twitter feed so make sure you don’t miss any of the excitement and stay tuned for our bird song.